The Battle of Plymouth, April 17-20, 1864, was the last major Confederate victory of the Civil War and the third largest battle fought in North Carolina. Two North Carolinians, Gen. Robert F. Hoke and Gen. Matthew W. Ransom, led the Confederate infantry while Commander James W. Cooke, another native son, had charge of the ironclad ram CSS Albemarle. 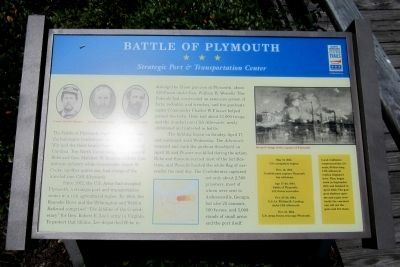 Since 1862, the U.S. Army had occupied Plymouth, a strategic port and transportation center in a rich agricultural region. By 1864, the Roanoke River and the Wilmington and Weldon Railroad comprised “The Lifeline of the Confederacy” for Gen. Robert E. Lee’s army in Virginia. To protect that lifeline, Lee dispatched Hoke to dislodge the Union garrison at Plymouth, about 3,000 men under Gen. William H. Wessells. The Federals had constructed an extensive system of forts, redoubts, and trenches, and five gunboats under Commander Charles W. Flusser helped protect the town. Hoke had about 13,000 troops and the ironclad ram CSS Albemarle, newly christened and untested in battle. rammed and sank the gunboat Southfield on April 19, and Flusser was killed during the action. Hoke and Ransom carried most of the fortifications, and Wessells hoisted the white flag of surrender the next day. The Confederates captured not only about 2,500 prisoners, most of whom were sent to Andersonville, Georgia, but also 25 cannons, 500 horses, and 5,000 stands of small arms and the port itself. Confederates capture Plymouth but withdraw. Battle of Plymouth; U.S. forces surrender. U.S. Lt. William B. Cushing sinks CSS Albemarle. U.S. Army forces reoccupy Plymouth. Local craftsmen constructed the 3/8-scale, 63-foot-long CSS Albemarle replica displayed here. They began work in September 2001 and finished in April 2002. The gun-port shutters operate and a gun crew inside the casemate can roll out the guns and fire them. 3. 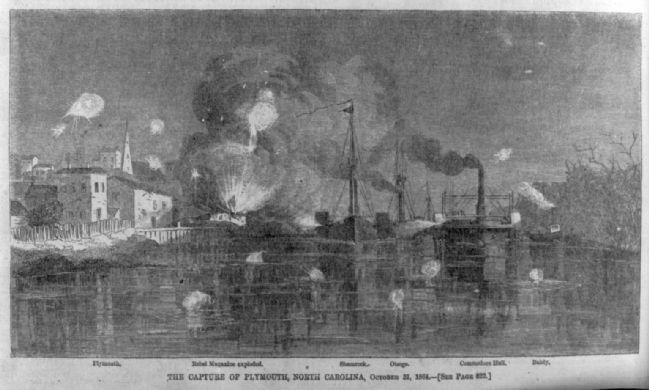 The capture of Plymouth, North Carolina, October 31, 1864 1864.
of East Water Street and Madison Street, on the left when traveling east. Touch for map. 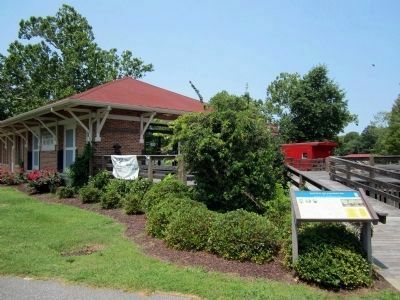 Located at the entrance to the Port O’ Plymouth Roanoke River Museum. Marker is at or near this postal address: 302 E Water St, Plymouth NC 27962, United States of America. Touch for directions. Other nearby markers. At least 8 other markers are within walking distance of this marker. Replica 6.4 inch Brooke Rifled Cannon (a few steps from this marker); Siege of Plymouth, NC (within shouting distance of this marker); CSS Albemarle (within shouting distance of this marker); a different marker also named CSS Albemarle (within shouting distance of this marker); Rt. Rev. Alfred Augustin Watson (about 300 feet away, measured in a direct line); Latham House (about 600 feet away); Cushing’s Torpedo (about 600 feet away); Washington County Courthouse (about 700 feet away). Touch for a list and map of all markers in Plymouth. More about this marker. On the left are portraits of "Comm. Charles Flusser", "Comm. James Cooke" and "Gen. Robert F. Hoke". On the right is "Harper’s image of the capture of Plymouth." Credits. This page was last revised on June 16, 2016. This page originally submitted on July 1, 2012, by Bernard Fisher of Mechanicsville, Virginia. This page has been viewed 486 times since then and 11 times this year. Photos: 1, 2, 3. submitted on July 1, 2012, by Bernard Fisher of Mechanicsville, Virginia.